I make a nice compound butter with adobo sauce and chipotles, but being on a diet, I’m trying to take it easy on the butter. Usually I roast the corn and douse it in butter after the fact, but this time I decided to roast the corn with the butter (very little!) and adobo on it. Added a bit of lime juice and some garlic to provide depth. Really really good! 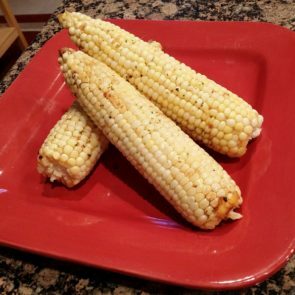 I love corn, especially when roasted in foil on the grill! Add some adobo and lime and what could possibly go wrong? Nothing, that’s what. Absolutely nothing!